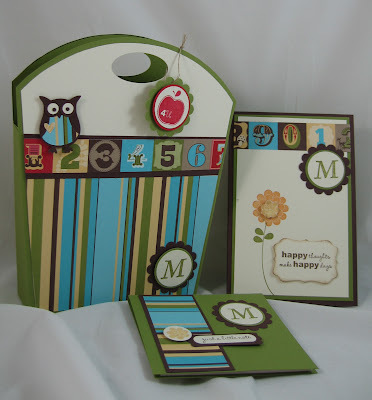 Designs by Sharon: Hoot's Got Stamps? Don't forget to comment on the 'Halloween Candy' (#1 and #2) posts, to enter the drawing for both blog candy give-a-ways! My downline meeting is tomorrow, Wednesday Oct. 13th @ 4:30p. I am happy to say that my downline has grown, and hopefully keeps growing. I have made these cute little items for each of them. I really wanted to do something with this cute little paper tote, so I filled it with other paper crafts. The item standing is a Stampin' Up! note pad. The item laying down is a Stampin' Up! post-it pad. It is monogrammed for Michelle. Each of my downline members will have their own, and theirs will be monogrammed, also. Thank you for looking! And don't forget to post your comment on my Halloween candy posts! Wow love this as a teacher it is about this time of year I need a pick me up.